I love fall and all the delicious recipes that seem to burst with flavor this time of year. 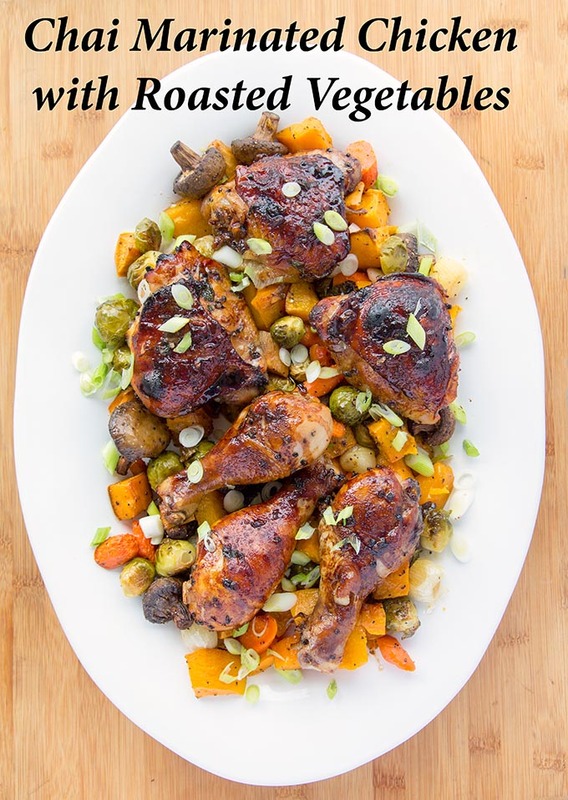 My fall inspired Chai marinated chicken with roasted vegetables is the perfect comfort food for your family's dinner table. 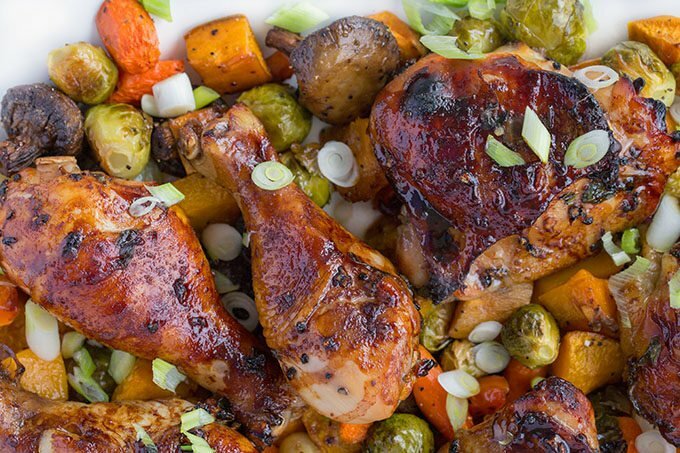 When the weather turns colder, my thoughts turn to comfort foods like my Chai Marinated Chicken. Wouldn’t your family love to sit down to this oh so delicious plate of Chai Marinated Chicken? 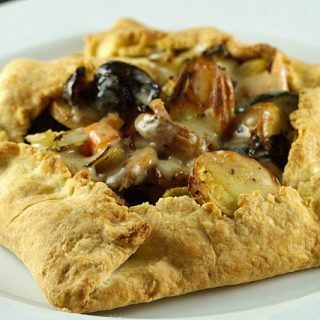 The roasted vegetables make this fall inspired recipe perfect for those cool autumn evenings. The origin of Chai tea dates back more than 5000 years. The name chai is actually the Hindi word for tea, which was derived from cha, the Chinese word for tea. In this case, the Hindi term chai means a mix of spices steeped into a tea-like beverage. Recipes for chai vary across continents, cultures, towns and families, with many variations of this delicious beverage. Oregon Chai® is Organic and Non-GMO Project Verified and is my favorite brand of chai tea. It’s my indulgent treat, so I want to make sure what I am drinking is worth every sip! 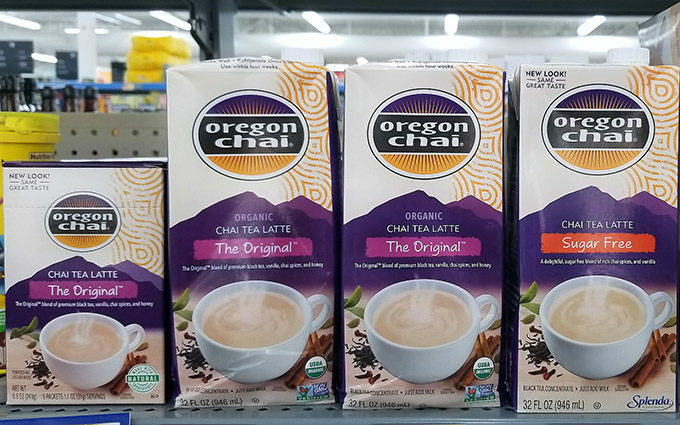 You can pick up Oregon Chai Tea Latte Concentrate at your local Walmart and you can save $1.00 on any 1 Oregon Chai product at Walmart from 11/16/18-11/30/18, or until supplies last. You can find the rebate here. I love shopping at Walmart. They have all of the ingredients that I need for my recipes. Shopping at Walmart couldn’t be any easier! Sweet, creamy, and full of warm spices, chai is a pure comfort pick-me-up and I try to savor a cup whenever possible. It’s my escape from the everyday chaos of life. Can you Cook with Chai Tea? 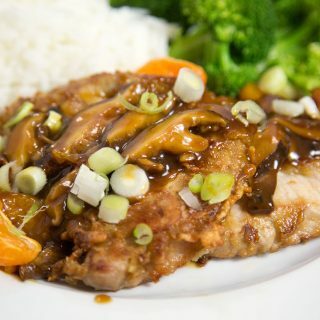 Although the flavors of Chai blend seamlessly to sweet flavors, they can also be used in savory dishes, as I have with my Marinated Chai Tea Chicken. The possibilities are endless and Oregon Chai Tea Latte Concentrate will be a staple in your kitchen as it is in mine. 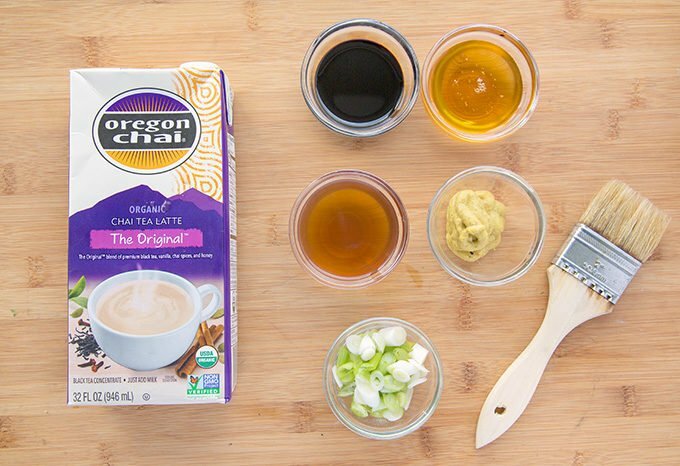 Oregon Chai can be incorporated into many of your favorite fall recipes. 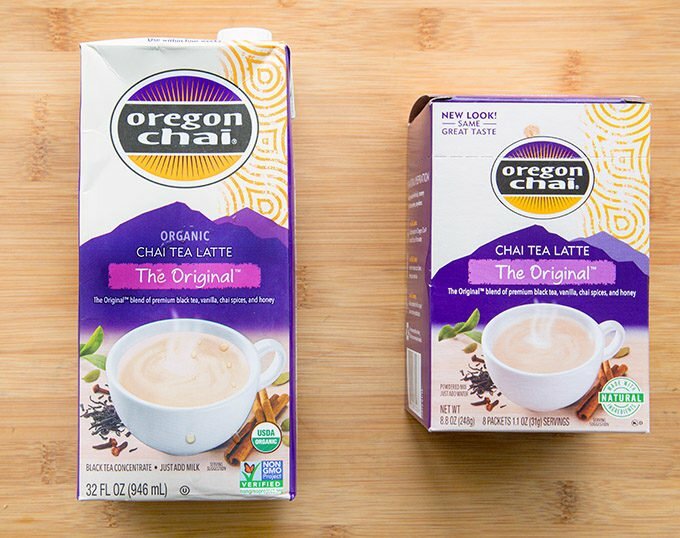 What deliciousness will you be making with Oregon Chai? The first step in making my Chai Marinated Chicken is gathering the ingredients to create the marinade. 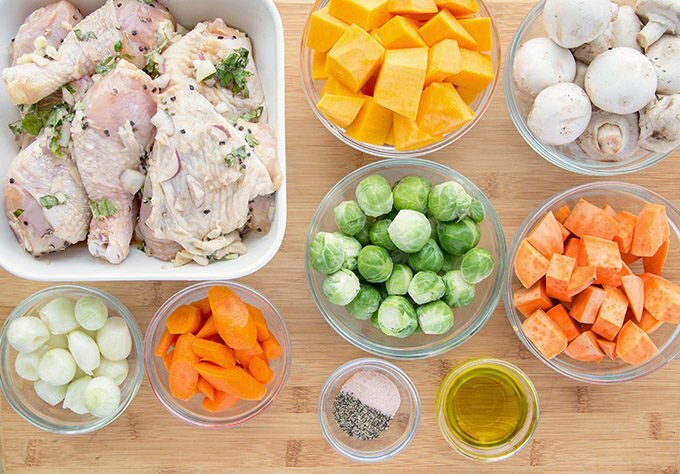 After mixing all of the ingredients together, the marinating chicken gets covered and goes into the refrigerator overnight to marinate (12-24 hours is best). 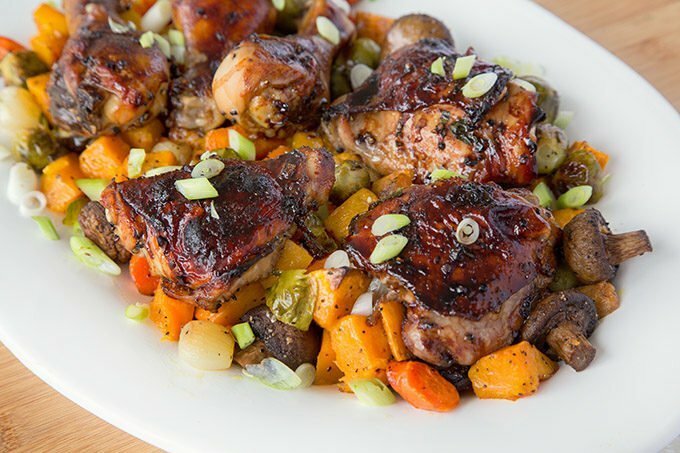 After marinating the chicken, it’s time to gather the vegetables for this flavorful dish. In chef speak we call this the mise en place (everything in its place) and it’s how I start every recipe I create in my kitchen. It makes the cooking process go more quickly and ensures you have all the ingredients on hand. With the chicken and vegetables in the oven, I gather the last ingredients I need to make the chai glaze for the chicken. The glaze will be brushed on the chicken towards the end of the cooking process. 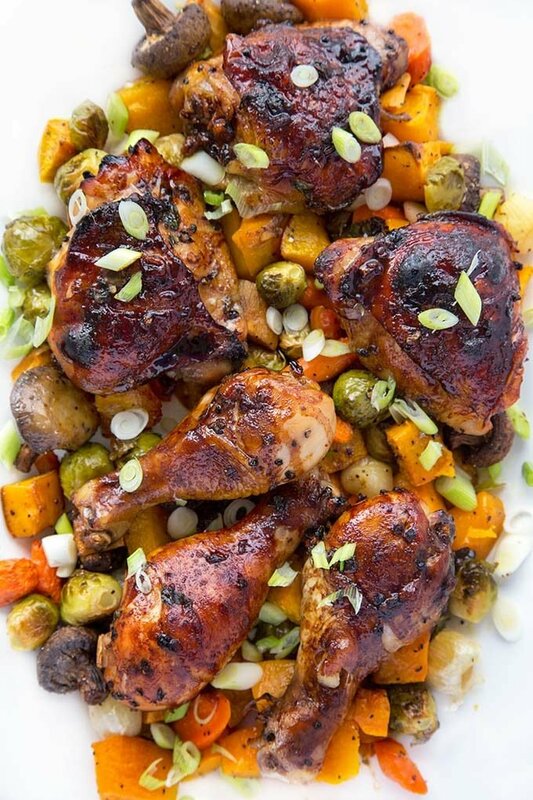 After the glaze has been applied, the dark rich color will appear on the Chai Marinated Chicken, and the delightfully fragrant aroma of Oregon Chai will permeate throughout your home. My wife kept saying it smelled like Thanksgiving. 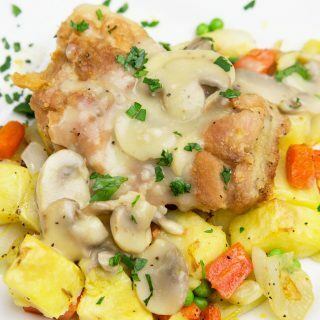 Just imagine how happy your friends and family will be when you bring this deliciousness to the table. And if you’re looking for more fall inspired recipes, check out my Peppered Pork Loin with a Pecan Fruit Sauce. Mix all the ingredients together for the glaze, blending until they are fully incorporated. Set aside till needed. Remove chicken from marinade and place on baking dish. Add some of the marinade to the dish, discarding the remainder. In a large bowl, add all of the cut vegetables, oil and sea salt and black pepper. Mix thoroughly and place on a baking sheet. Place both pans in the oven and roast for 20 minutes. After 20 minutes, remove the chicken from the oven to add the glaze. Brush glaze on the chicken pieces using a pastry brush. Repeat this process again in 7-10 minutes, adding a second coating of glaze and increase the oven to the broil setting. Remove the vegetables at this time. 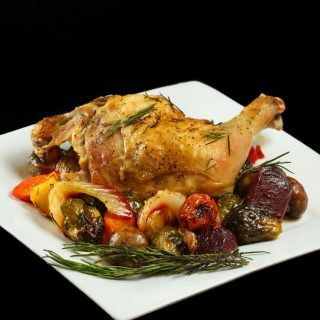 Remove the chicken from the oven when finished and/or the chicken has reached an internal temperature of 165 degrees F.
Place the vegetables on a large serving platter. Add chicken to the top of the vegetables and garnish with scallions. This recipe makes a wonderful presentation. Chai is not something I have in my pantry but looks like an ingredient well worth the try. How much red onion do you use in the marinade? What is the 5th ingredient pictured in the Chai Glaze? It only lists the tea, honey, soy, and mustard. two tablespoons of chopped red onion. The ingredients pictured in the bowls are chai tea, honey, soy and mustard. The fifth bowl is scallions for the garnish. 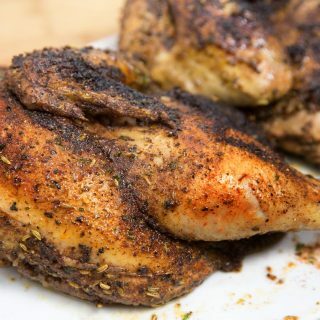 Ooo this chai marinated chicken recipe look scrumptious! 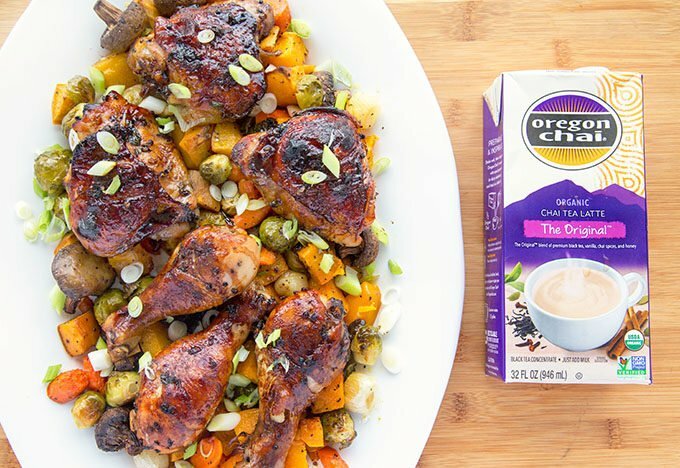 I wouldn’t have ever thought to use chai with chicken, but I’ve gotta try this one out! What a brillant way to prepare chicken! It sounds and looks absolutely delicious and I will be trying it myself this fall for sure! Oh my God, comfort food like this delicious marinated chicken is the best company for cold and rainy days. I love how you serve it with vegetables, a favorite of mine as well. Omg can we say yum!!! I’m always looking for new chicken recipes. I will definitely be giving this a try! What an interesting combination of flavors. I would never have thought of mixing chai and chicken together. Your recipe is pretty simple to follow, thank you, and the final dish looks amazing! Definitively going to be trying this as the weather cools. I’ve never cooked with chai before, but now I can’t wait to try it! The flavor must be amazing and perfect for fall. Oh wow! I love Chai tea as a drink so much! like I’m in love with it, but never thought of using it as a marinade. This is an interesting recipe that looks so mouthwatering. I see you made this with the drumsticks, which are my favorite part of the chicken. Yum, dark meat. The Chai Marinated Chicken is going on next week’s menu. The roasted vegetables look amazing. Oh wow this looks amazing! I love trying new dishes and this one appears to be bursting with flavour. I have actually never heard of chai before, let alone tried it, but now I am curious to give it a go. I will make this next week for my family! 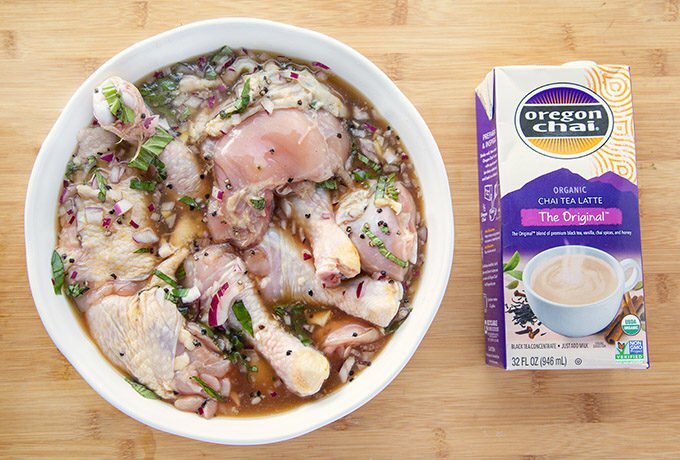 I love chai but I never ever thought to use it for chicken marinade. I am so making this next week. Not only does it look yummy but easy to make. This sounds like a great dish. I’d never have thought of using chai in a marinade… my family would love this meal! I’d never think to use CHAI but now that I think more about it, it really is a combo of delicious spices! SO WHY NOT!! Chef Dennis: You had me at chai but then you went and threw in chicken and now I’m sitting here at home drooling over this chicken! Oh my, this looks delicious. 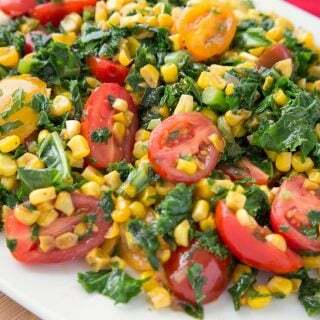 I’m pinning because I’m making this dish next week. Chai is something I’ve never cooked with before, but it sounds interesting! I can’t wait until it cools off a bit so we can enjoy meals like this. Chai marinated chicken, what what?!?! And Brussel Sprouts? Not going to lie, this looks amazing. So many flavors! I can’t help but stop and drool over your recipes every day on here. I wish there was time to make every one. Your idea to use chai in a marinade is one I haven’t heard of before. So interesting! I never would have thought of it myself. It sounds delicious. 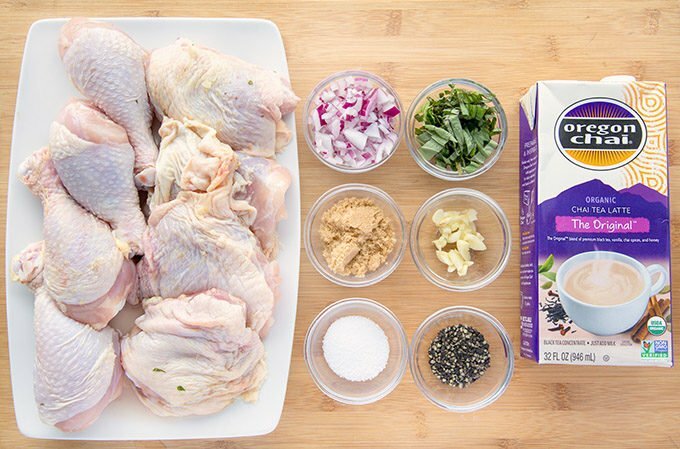 I never thought of marinating chicken with thai tea – but what a great idea for something different!